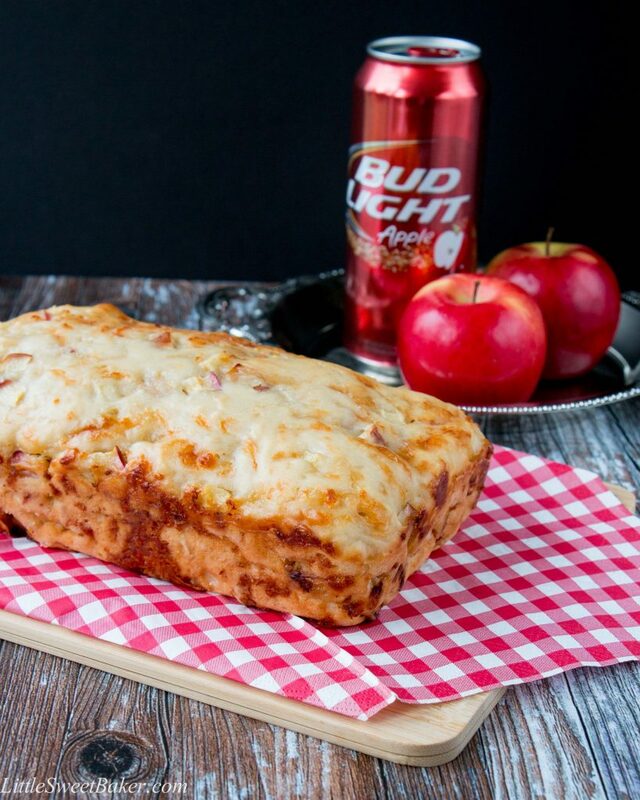 This savoury beer bread pairs the classic flavors of apple and cheese. 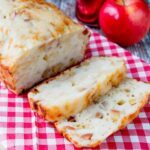 There are chunks of sweet Ambrosia apples and smoked Gouda cheese baked into this irresistibly moist and flavorful bread. This is a sponsored post. 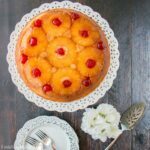 I had the wonderful opportunity to work with the Ontario Apple Growers to create this recipe for you. Though monetary compensation was received, all opinions are my own. Things are already getting busy here at the Ernst house as our calendar is filling up with holiday gatherings. I’ve prepared my list of things to make and bring to each event including this beer bread that can be served as an appetizer or as a side dish to accompany any holiday meal. This is my second of three recipes in collaboration with the wonderful folks at Ontario Apple Growers. This easy one-bowl recipe starts with your usual suspects: flour, sugar, baking powder and salt. Then you mix in your beer of choice. I suggest a light crisp beer to compliment the fresh apple taste. Now, I took things to a whole other level by using apple beer to really emphasize the apple flavor in this bread. Next, you fold in some chopped apples and grated cheese. I chose Ambrosia apples for this recipe because it’s my favourite type of apple right now. I just love how sweet and crisp they are. I went with smoked Gouda because the smoky flavor and saltiness of the cheese goes well with the sweetness of the apples. But if Gouda is not your thing, a sharp or smoky cheddar works too. The bread only takes about 45-50 minutes in the oven, so in less than an hour you have warm fresh bread ready to be served! There is no kneading or waiting for the bread to rise, that’s the great thing about beer bread. The yeast in the beer instantly reacts with the sugar, so there is no waiting. The texture of this bread is hearty, dense and chewy. The taste is slightly sweet and fruity with a creamy-smoky aroma. It is fabulous served on its own as an appetizer or along side of a cheese platter. You can also serve it as a side to go with any holiday meal. 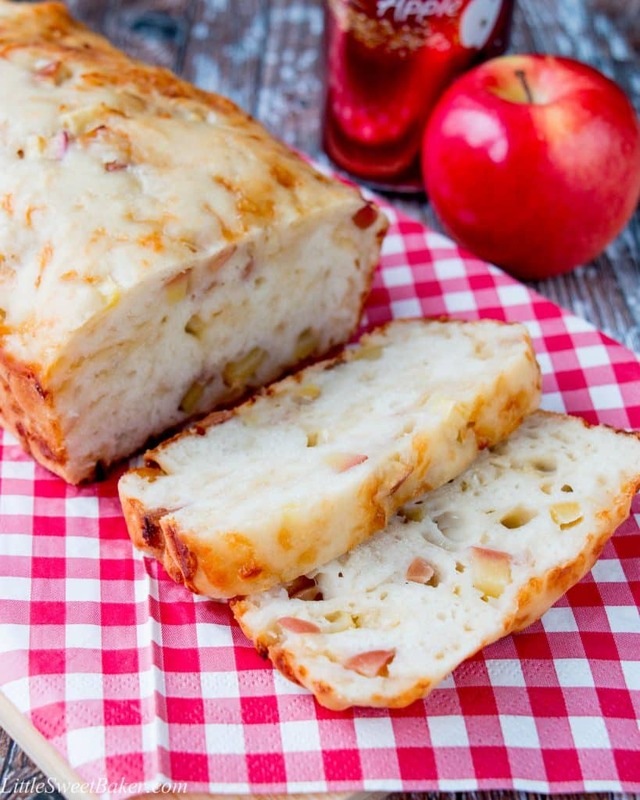 This savoury beer bread pairs the classic flavors of apple and cheese. Preheat oven to 350F and generously butter a 9×5″ loaf pan. In a large bowl, toss together the flour, sugar, baking powder and salt. Slowly pour in the bear and mix until just combined. Fold in the apples and cheese. Spoon into prepared baking pan. Bake for 45-50 minutes or until a toothpick inserted into the center comes out clean. Melt the 1 tbsp of butter and brush over top of the bread. Serve immediately. Leftovers can be stored wrapped up in the refrigerator, sliced and reheated in the toaster before serving. I made the for a bbq and it was amazing! 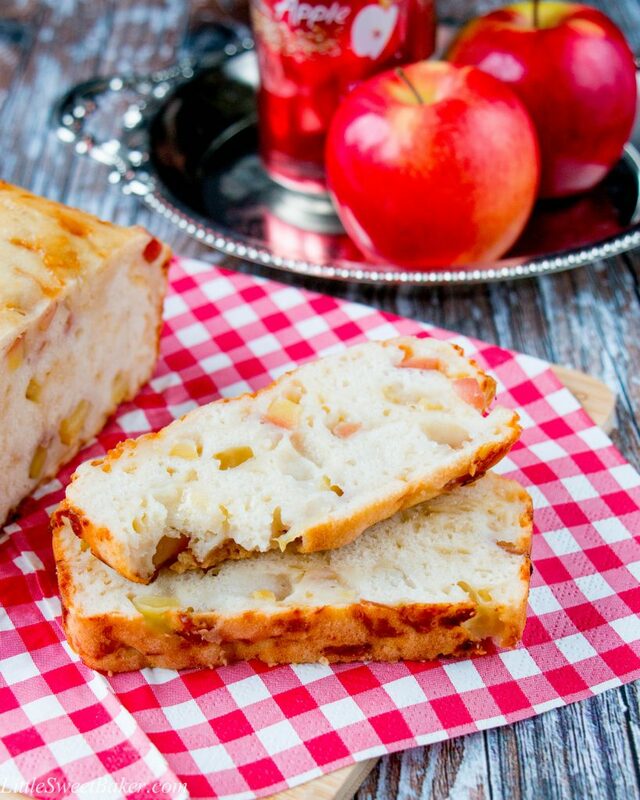 The flavor of the apple beer and smoked gouda is perfect alongside bbq meats. Definitely making again! So glad you liked it, David! And you’re so right, it’s a great side to any bbq. Thank you for your comment! I baked this recipe for my co-workers today and they all loved it! I am planning on baking it again for them soon! does this reheat well if all is not eaten immediately? Apple lager is a new beer for me! Yes always to gouda in anything – I bet it really comes through in your bread. Thanks for bringing your lovely bread to the party Lily – I’m sure everyone will love it, I mean who does not like bread?